One of the biggest differences in being pregnant with your second is figuring out how to explain the massive change that is about to happen to your first-born. The closer it gets to go time, the more I’ve been feeling guilty about how our little dude’s world is about to change in a moment and he has no idea what it all means…because, let’s be honest, we have NO idea what life as a family of 4 is going to look like. There really is no way to actually prepare a toddler for becoming a big brother or sister…but we have asked close friends, pediatricians, parenting experts and the amazing staff at our preschool for their best advice and here is what we will be doing to try to make this transition as smooth as possible for all of us. 1. Minimize any other big changes. Having a new baby is a huge change in your little one’s life, and it can be a LOT for them to process. Now is not the time to decide to sleep train, potty train, or start any new routine for your little ones. Make sure that if you do need to do any “big changes” you start them months before your little one’s arrival if possible. We decided to throw potty training out the window and spend the early part of my third trimester focusing on getting Avery to sleep better in his own room. For the last month of your pregnancy focus on establishing a fairly constant routine that you can manage to keep consistent after baby arrives. 2. Let them be a part of the preparations. Have them help unpack baby toys, clothes and gear. Start doing this EARLY and do it in stages. We found that as we unpacked things, Avery recognized that they were all “HIS” This led to a lot of conversation about sharing with the baby and allowed him to play with his old toys and get used to having all the baby gear around the house. Don’t be alarmed if your preschooler wants to hop into the bassinet or swing, or suddenly starts sucking on pacifiers or wanting to drink out of bottles. We found that it worked best to let him explore all of the toys and also have a conversation about how there are some things that he will miss about being a baby like pacifiers and drinking from bottles, but that there are so many things he can do that a baby can’t like ride a bike and play on the playground. 3. Wait to talk about hospital plans until a few weeks before. Talking about this early can cause a lot of anxiety. Avery overheard me talking to my mom on the phone about our options for when I go into labor, and for a week or so after he cried when I tried to drop him off at preschool because he thought I might not come back to get him. Lesson learned – too much notice (even accidentally) is NOT a good thing. Since I’m 40 weeks now, we had a simple talk the other morning about what might happen now that the baby is almost ready to come out. 4. Keep your explanation simple. We told him that when the baby comes, mommy and daddy will go to the hospital because that is where the doctors and nurses are to help get the baby out and make sure he/she is healthy. And that Mimi or one of his friends’ mommies will come and play at the house with him and as soon as the baby is out daddy will come get him to come and meet the baby. Mommy might have to stay at the hospital with the baby and the doctors but he will come every day and stay as long as he wants. 5. Start brainwashing early. There is NO need for them to think anything bad or negative is coming. You will have a lot of anxiety about them feeling left out or jealous…keep this to yourself. Address those big feelings when they surface. Until then, let them know this is a happy thing. That having a brother or sister is getting a friend for life and filling our family with more love. 6. Get them excited about being mommy’s little helper. Start thinking of special jobs they can help with like being the diaper-getter or teaching them how to gently bounce the baby in the bouncer. We got a rolling cart for breastfeeding and baby supplies and A has been practicing pushing it around from room to room. 7. Read about it! There are a lot of really great books on the topic – BUT make sure you read them first. I found that a shocking number of books focus largely on the negatives of having a new baby which I find extremely unnecessary and not super helpful before baby’s arrival. There is no need to inform your little one of the potential negatives – this will only create unnecessary anxiety. Check out my post with our favorite books on becoming a new sibling here. These are the books I’ve found that are positive, informative and helpful to toddler and preschool aged kiddos. 8. Take them to pick out a welcome present for the baby. We took Avery to pick out a little Angel Dear lovey and a Melissa and Doug stuffed animal that had a “big brother and little baby” penguin. It’s technically a mommy/baby penguin, but we decided why not be a brother and baby?! Avery loved the idea, especially since he gets to keep the big brother and the baby gets the baby. He’s very excited about playing with them with his new brother or sister. Let them go to the store, pick it out and help wrap it. Then give them the special job of bringing it to the hospital when they visit. These are all things you can do now to prepare for your new baby. 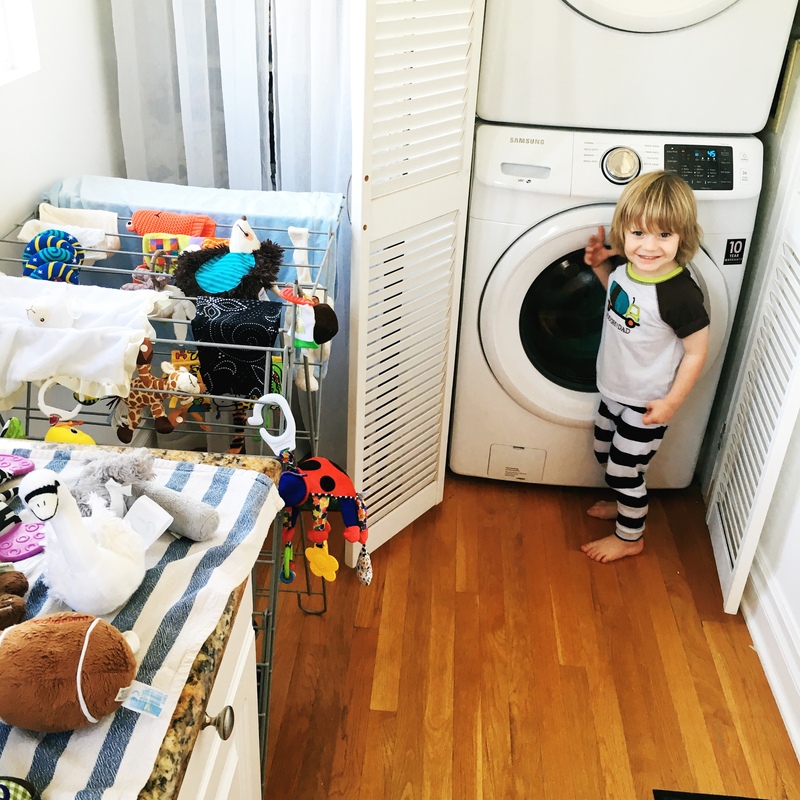 We have definitely found them all to be a huge help in explaining what is happening, getting our son used to the idea of the physical changes in our house that are happening, helping him get comfortable with the idea of sharing his toys and baby things, and allowing him to feel like he is a PART of this change and not a bystander. What other advice have you gotten (or if you have been through it, do you have) on helping a toddler get prepared for baby’s arrival?! Why you may want to wait until 12 weeks to announce your pregnancy.